Giving back is an inherent part of TDS’ company culture, and this is especially evident around the holidays. Employees from across our footprint helped make a difference by donating to various nonprofit organizations, supporting community events, and sponsoring people in need. Employees in Madison, Wis. gave hand-selected gifts to over 100 individuals through the Porchlight Angels program and made monetary donations as well. TDS has been teaming with Porchlight, a local agency working to decrease the homeless population, by serving as Angels and helping those in need. Toys for Tots—four overflowing boxes of toys (one of them is pictured above). Domestic Abuse Intervention Services—three large oversized bins filled with necessities and gift cards. Dane County Humane Society—three jumbo-sized bins filled with pet supplies, peanut butter, food, and gift cards. Independent Living—two massive-sized bins filled with necessities plus gift cards. Salvation Army—nearly 100 employees volunteered to ring bells for 50 hours. Second Harvest Foodbank of Southern Wisconsin—nearly 17,000 meals resulting from the canned food drive, phone system donation for the annual Share Your Holidays telethon, and the employee charity of choice vote. Badger Honor Flight—received $3,500 in the employee charity of choice vote. In Mt. Juliet, Tenn., TDS sponsored the city’s annual Christmas parade along with the holiday 5K and marathon. 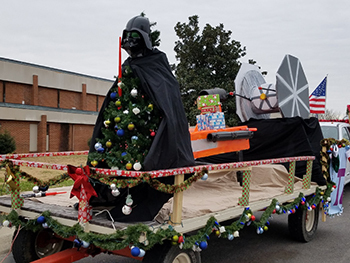 This year’s parade theme was “In a Galaxy Far, Far Away.” TDS employees built a float that screamed both Star Wars and Christmas, complete with a Darth Vader Christmas tree. Check out more photos from the events here. Happy holidays from all of us at TDS, and thank you for letting us be part of your community!